#NOTD: Help Me Pick My Next Manicure! Marble Or Sunset Ombre Nails? Scrolling through Instagram is one of my favourite things to do while I'm on my way to get a gel manicure. And some of these nail art designs are so fascinating. 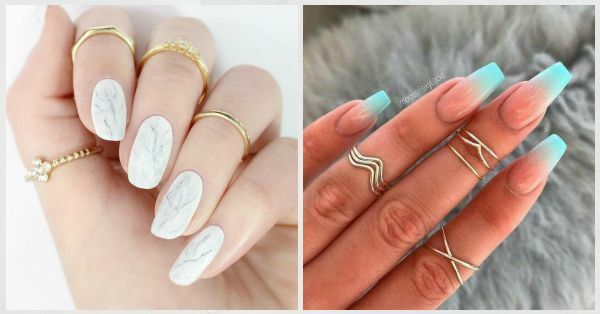 I stumbled upon these really cute nail art designs and I'm super confused between marble nails and ombre sunset nails. My heart says sunset because lord knows I need a vacation, but my obsession with all things marble is pulling me towards the marble manicure. What nail design would you opt for on your next manicure? Marble or sunset? This gorgeous sunset inspired ombre nails seem perfect for your vacation don't they? BRB, I'm visualizing all the photos I'm going to take with my nails! If ombre nails don't float your boat, maybe it's time to switch that boring French manicure with a killer marble manicure instead? A quick search will fetch you everything from ice cream nails to insect crusted ones, nail art inspiration stems from the strangest of places! But if you're looking for more nail art inspiration for sunset and marble inspired nails, keep scrolling! Tell us which nail design you would pick, we'd love to know!